We reviewed our experience with gastroschisis (GS) complicated by intestinal atresia over the last 26 years. Our aim was to determine the effect of different management strategies employed and the morbidity associated with this condition in our unit. A retrospective casenote review was carried out. Data regarding the operative management of the GS and atresia was recorded. Primary outcome measures included time to commence and establish full enteral feeds, duration of parenteral nutrition, complications and outcome. Of 179 neonates with GS, 23 also had intestinal atresia. 13 underwent primary closure of the defect, 5 had patch closure and 5 had a silo placed. 4 atresias were ‘missed’ at first operation. The 19 recognised atresias were managed either by stoma formation, primary anastomosis or deferred management with subsequent primary anastomosis. There was wide variation in the outcomes of patients in each group. 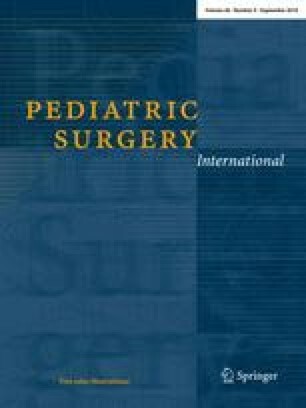 Differences in outcome between the management strategies are likely to reflect an inherent variability in patient condition, site of atresia, and bowel suitability for anastomosis at first surgery, rather than the mode of surgical management. Individual management plans should be tailored to the clinical condition of each patient.